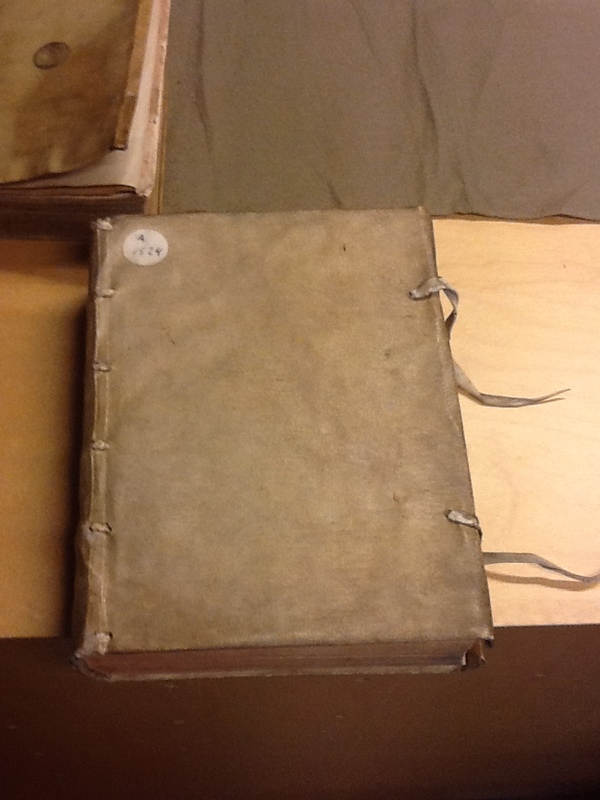 For the last few days I’ve been in Antwerp as part of the NEH Summer Seminar, “Tudor Books and Readers, 1485-1603” led by John N. King and Mark Rankin. So far, it has been an amazing experience. I arrived in Antwerp Sunday morning, catching a bus from Brussels and then walking to my hotel. We’ve been staying at the Hotel National; I was worried about the location because the reviews online had been less than stellar, but it’s actually been a great place to stay. I’m under the impression that the hotel has changed management and gotten a thorough makeover and renovation (though there are a few things that seem to still be undergoing changes!). The seminar itself has been wonderful. 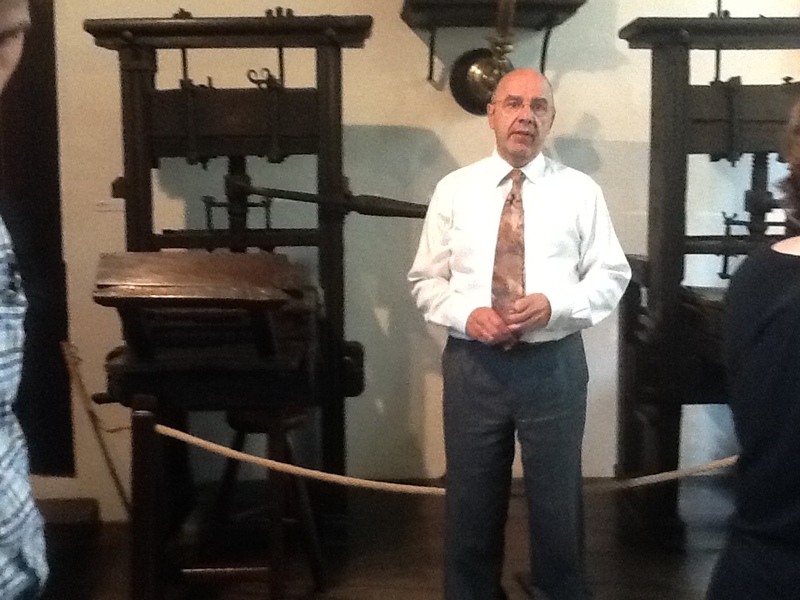 We’ve benefited greatly from the guidance and help of Professor Guido Latré, who has been showing us around Antwerp, and especially around the sites related to early modern printing. The highlight so far has been the Plantin-Moretus Museum. The PMM is the location of the second largest printing house in Europe during the sixteenth century, with something like 16 presses (the only larger printing house was either in Italy or France with 24 presses), and two of the presses that are still in the PMM are the oldest extant printing presses in Europe, dating back to the early seventeenth century (probably 1602?). Plantin’s Biblia Regia, or “King’s Bible,” printed between 1568 and 1573 in eight volumes. Before we got a tour of the Museum, we spent a few hours looking at some of the books printed from the sixteenth century. 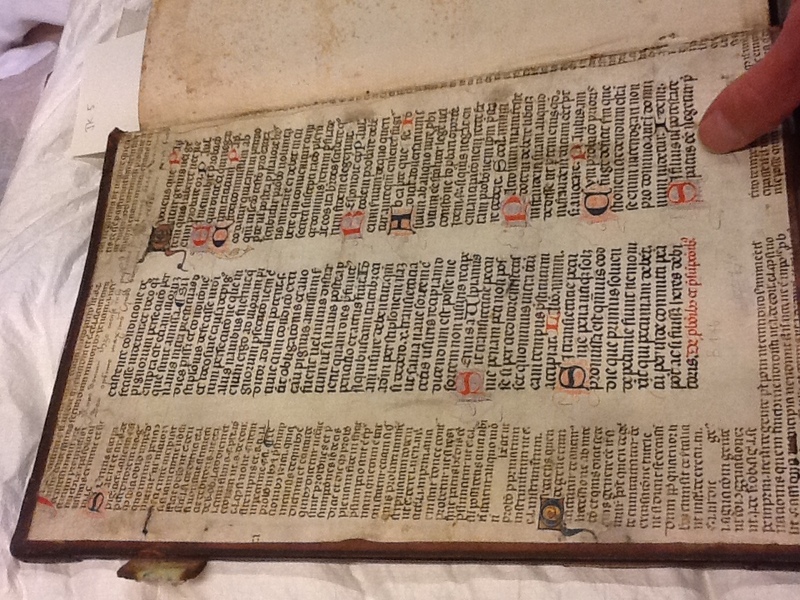 The most interesting, I think, was the eight-volume Polyglot Bible. The Old Testament makes up four volumes, the New Testament one volume, and the last three volumes include various dictionaries and references for the scholars that would have used these books. In the picture I’ve included, you can see the Hebrew, Greek, and Latin texts of the Old Testament (I think this is Genesis, but I can’t remember) in the columns on top, with Aramaic commentary and its Latin translation on the bottom. There are also notes along the edges to help identify Hebrew roots. 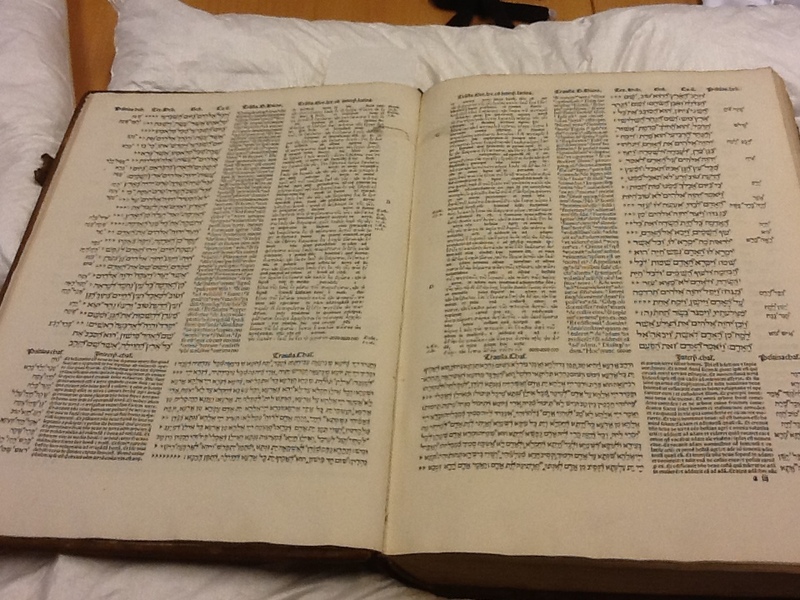 The New Testament included Greek, Syriac, and Latin texts. 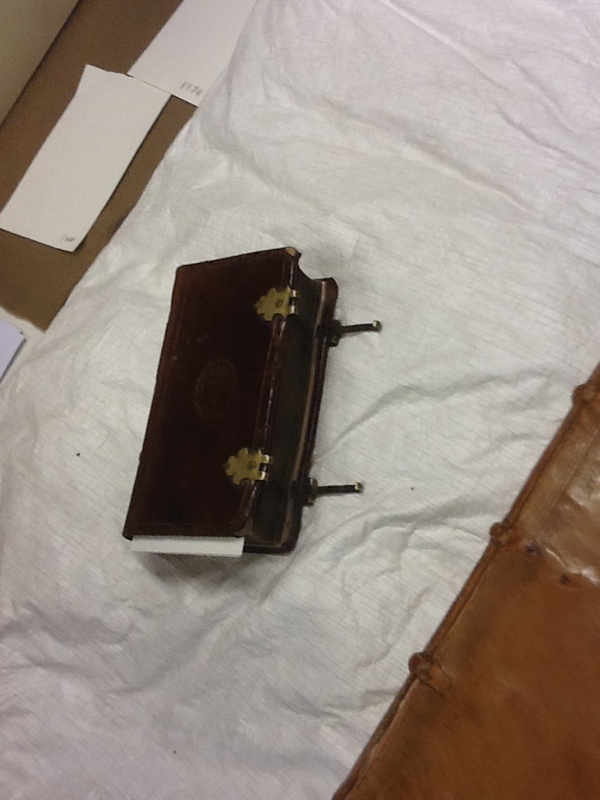 One of the interesting things about this and other books in the collection was how they showed off the different ways books were bound. 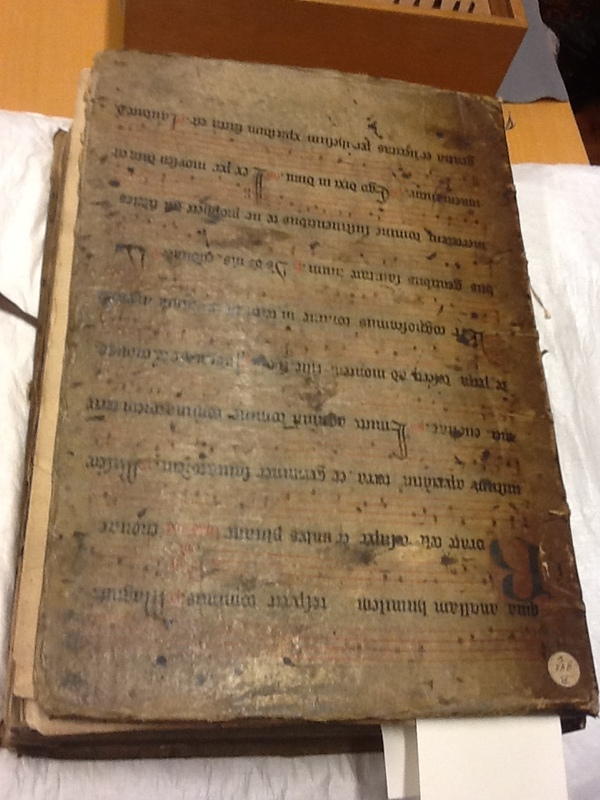 One book used old manuscripts as end papers; another had appropriated what I think might have been a vellum sheet of music for its cover. Some had clasps to keep them closed, others had strings that could be tied. During the tour, we got to see not just more books and printing materials, but also a lot of artwork. Antwerp is famously the home of Peter Paul Rubens, the Baroque painter, in the seventeenth century. Rubens was a great friend of the family and collaborator with the Plantin-Moretus printing house. He did artwork for several title pages, and also did portraits of several members of the family. According to our tour guide, there are actually more Rubens paintings in the Plantin-Moretus museum than in the Rubens house itself, which is just a few blocks away. In the final part of our tour, we were treated to a demonstration of how to cast type, use a compositor’s stick, ink the press, and print a sheet in the early modern style of the printing house. We were even allowed to make our own print of a sonnet (in French) by Plantin. 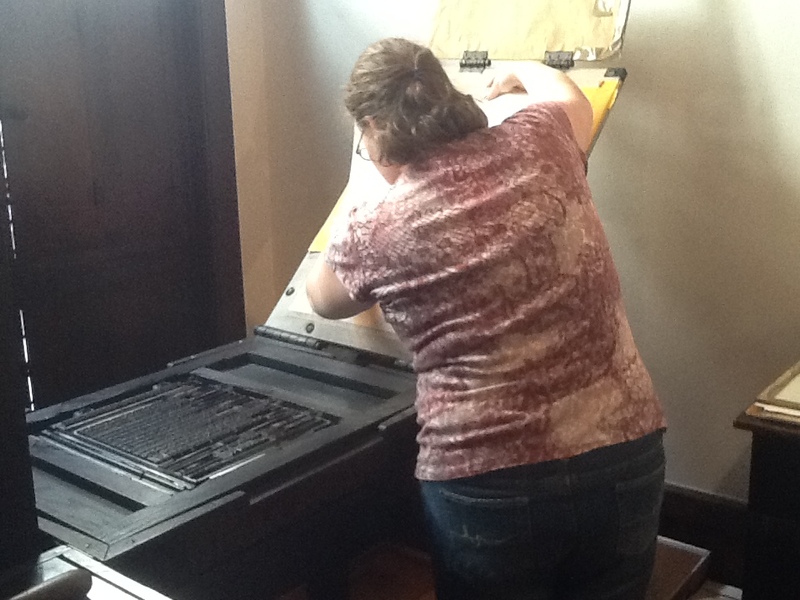 One of the members of our group has video of this demonstration from a previous year, so I didn’t take many pictures of this, but a friend took this picture of me using the press. I’m placing the paper right before making a print. Yesterday after the trip to the museum, we had dinner at De Pelgrom, a restaurant that serves (mostly) authentic Belgian food by candlelight in the medieval cellars that would have been very much like the places where illicit (that is, Protestant) books would have been stored before being smuggled into England. 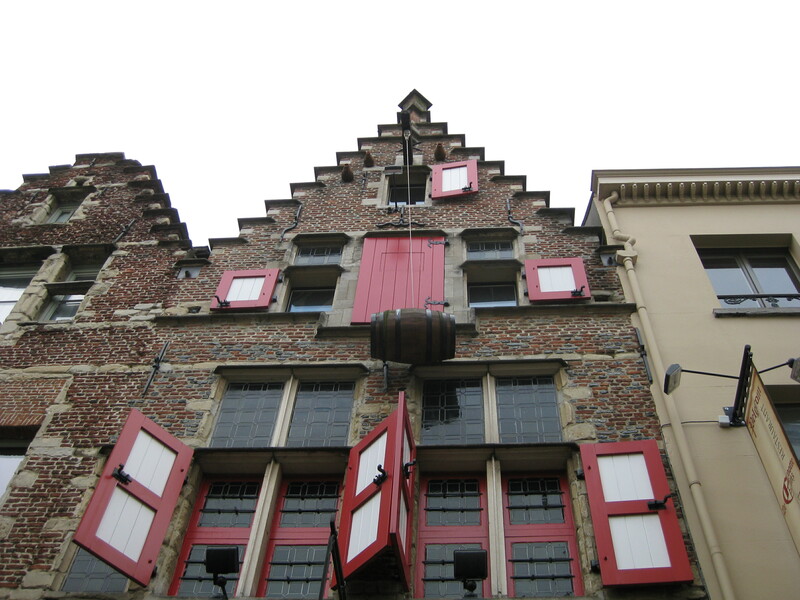 The restaurant is marked by a wine barrel hanging from the top of the building. We had a meal that started with cheese croquettes (the Belgians love their cheese!). Then I had the Flemish (or Antwerpen) stew, which is made with the local De Koninck beer, and apple sauce. We followed that the traditional Belgian dessert of rice pudding. I liked the stew enough that I think I’m going to have to try making it when I get home. I didn’t get any good pictures of the inside of De Pelgrom because it was lit by candles, and my camera really couldn’t handle the lighting properly–it was too dark to use without a flash, and the flash completely destroys any sense of the atmosphere. 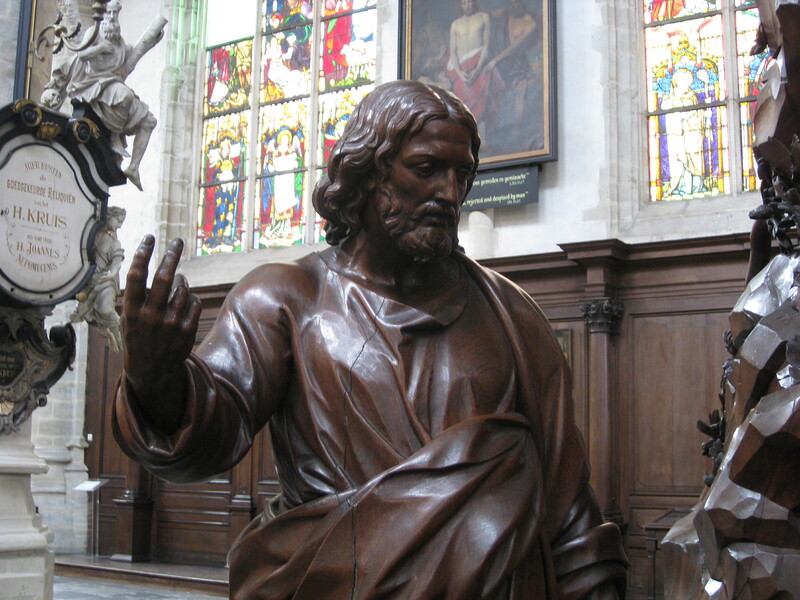 Today was more relaxed, and I spent most of my time wandering Antwerp, looking at a few churches (including the Cathedral of Our Lady), and buying Chocolate. 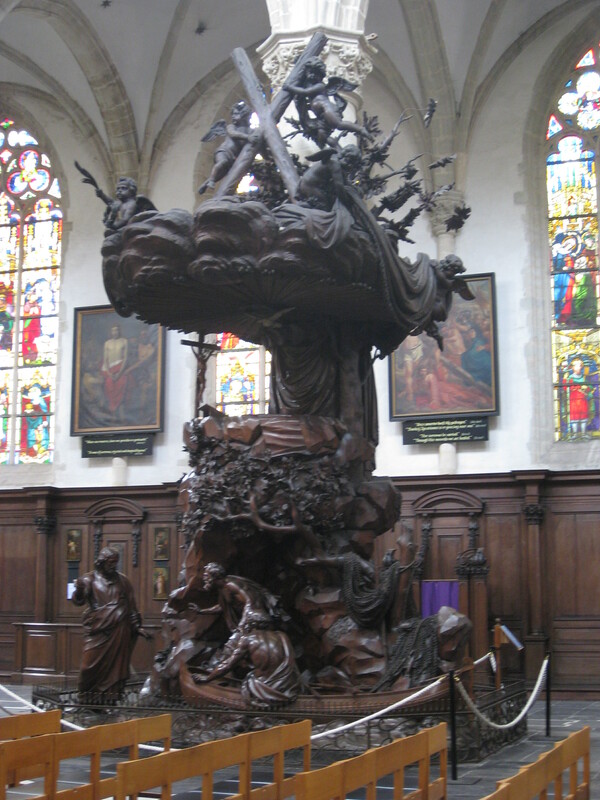 The most astonishing thing I saw in the churches was the incredibly ornate pulpits carved out of wood. The one in the Cathedral of Our Lady was amazing, but even better was the one in the church just across the street from Lessius College, I think it is the Church of St. Andrew. From what I can tell online (I can’t read Dutch, so the descriptions in the church meant nothing to me), it’s a 19th century pulpit. At the base is a life-size carving of Jesus on the beach with Peter and John in their fishing boat.